The highly advanced COMS satellite has three payloads; one for meteorology, one for ocean observation and one for communications. COMS will provide meteorology data to end-users around the globe, oceanography data for the Korean peninsula and experimental communications services in Ka-band, all from its orbital locations 116º and 138° East. As prime contractor for COMS, EADS Astrium will be responsible for the design and build of the satellite including both the meteorology and ocean imagers - the communications payload will be provided by KARI in Korea, as a Customer Furnished Equipment. COMS provides continuous image monitoring with the extraction of high resolution meteorological data from its multi-spectral imager. It will give early warning of hazardous weather conditions including storms, floods, sandstorms, etc and provide data on the long-term changes in sea surface temperatures and cloud patterns. 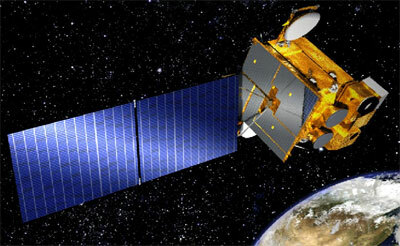 Earth observation data from COMS will be relayed to a processing station. Once processed, the data will be resent via the COMS satellite to weather forecasters, Earth observation centres etc around the world. COMS will also carry an Ocean Imager to monitor marine environments around the Korean peninsula and provide data (on chlorophyll etc) to assist the fishing industry in the region. It will also monitor both long and short-term changes to the marine ecosystem. The communications payload on-board COMS will allow in-orbit verification of advanced communication technologies and will support experiments covering wide-band multi-media communication services. The spacecraft will have a launch mass of 2.4 tons and a spacecraft power of 2.5 kW at end of life. The satellite, operating from geostationary orbit, will provide services for a minimum of seven years. COMS is primarily based on EADS Astrium's Eurostar-3000 spacecraft platform. COMS is KARI's first geostationary satellite and will provide Korea with its own meteorology and ocean data thus giving increased independence. COMS is part of a 15-year Korean space plan begun in the 1990s, and followed systematically ever since. Meteo Imager: the Imager is a multi-spectral channel two-axis scanning radiometer, and is capable of providing imagery and radiometric information of the Earth's surface and cloud cover over 5-channels - one visible channel (1 km ground resolution) and 4 Infra-Red channels (4 km resolution). Ocean colour Imager: the advanced Ocean Imager has a sophisticated focal plane providing for the first time ever, ocean data from geostationary orbit. The Ocean Imager will provide data over 8 imaging bands in the visible spectrum. Ground resolution over Korea is 500m. Meteorology Data Dissemination function: Using an S-band receiving antenna and an L-band transmitting antenna, this function will allow dissemination in HRIT and LRIT format of weather data. Communications Payload: The Ka-Band payload will provide three regional beams simultaneously. The Ka-Band Payload will provide the beam switching function for high speed multimedia services including the internet via satellite in the public communications network for all coverage.